Understanding Islam – Part 39 – Cordoba House (Mega Mosque) – Wake Up! Wake Up! A leader of the NYC Muslim community is one of the more vocal supporters of the Mega-Mosque. Many would consider him a ‘moderate’ Muslim and certainly one who appears to understand the need for harmony among all faiths. This is evidenced is his book, What’s Right With Islam (Imam Feisal Abdul Rauf, 2004, HarperCollins, NY, NY). [i] However a careful reading reveals several important elements that clearly point to a basis in Islam that can be problematic and impediments to the perfect harmony Rauf suggests. The most disturbing is his penchant for the requirement of Shariah Law, even in his most idyllic American society of mixed religions. God is referenced as one God common to all Abrahamic religions – Jew, Christian and Muslim. The question, however, is raised all too frequently, are the gods of each the same? Are there differences when you consider the Judaic God, the Christian God (the Trinity as One), and for the Muslim – Allah. If you read his book substituting Allah instead of God where applicable to the Islamic viewpoint a slightly different reading evolves. (see Blog: Allah v. God, Part 4 dtd. Dec. 15, 2009). Love must be considered in this comparison. For the Christian God, ‘love’ is constant and, according to 1 Corinthians 13, ‘does not insist on its own way and keeps no record of wrongs’ (paraphrased) Allah insists on being loved. And if as a Muslim you choose another way (another religion), then Allah suggests death as punishment. There is no love for an apostate of Islam. If there was evidence of neighborly Love in the Muslim world why are there no Christian Churches, or Jewish Synagogues or Cultural centers built or under construction (with the aid of Saudi $’s or any $’s) in major cities in the Muslim world? Do you, my reader, have the impression Muslims love their neighbors as the Imam says. Think about Berlin, Great Britain, France, as well as Muslim Countries such as Saudi Arabia, Morocco, Iran, Syria and others, how accepting are they? The reference to neighbors in the Quran suggest not love, but being ‘good’ to them, as ‘aliens’ (if not Muslim)(Sura 4:36), thus with limits – it is not unconditional love as far as I can discern. First, as to separation of church and state, he sees a need, as in the Islamic ideology, of a closer association (a requirement, in fact) of Mosque and State. The basic rational is to enact, legislate, the moral doctrines as noted in the Quran (via Shariah Law). God’s influence on authority must be legislated from the people, upward, not downward based on the dictates of the governing body. Locals should rule family life, as an example, based on their religion. Secondly, Sharia Law is essential to a common link of American democracy and Islamic ideals – which as espoused may simply be impossible. Such ideals would be taught and supported in the Mega-Mosque Cultural Center proposed. If ‘moderate’ American Muslims support the Constitution, why are there not more of the 6 million or so in this Country actively speaking up for America? Why are there not more, especially women, seeking freedom, especially from the constraints and dictates of Sharia Law? Allow religious communities more leeway to judge among themselves according to their own laws.” Note: according to their own laws!!! Only Islam allows humans to judge. Other (Abrahamic) religions leave it up to God on Judgment Day. The leeway Rauf requests is one-sided. As to Sharia, other religions do not impose ‘laws’, not by humans anyway, on their sins, allowing for the most heinous sins to be punished by civil law. God will punish all crimes committment against God, at the appointed time (Judgment Day). He notes (pg. 95) that “Democratic rule does not necessarily imply proper governance” a point which has merit as I agree it does depend on the electorate, but it is only possible, an important point for us all to remember, (pg. 96) “only if government officials respect their oaths to uphold the Constitution and not deprive the people of their rights.” He makes no mention of Muhammad breaking his oaths with the Meccan’s when he entered the City with an army from Medina. A Muslim in an ideal Islamic society is to use Muhammad as an example. Respecting oaths was not one of his attributes. Islamists are thus not required to be obligated to the Oaths of our Country (such as the Pledge of Allegiance) if it interferes with their Quranic foundation. Accepting other religions is proposed by Rauf as a goal, using Cordoba and Ghazali’s[ii] philosophy as a platform and plan of action. For Rauf a New Cordoba would be where Jews, Christians and Muslims, and all other faith traditions will live together. To achieve such would require ‘modernization’ of the Quran, which is not allowed by the tenants of the Quran itself – unless Allah willed. The Mega-Mosque support group is affiliated with the Cordoba Initiative (and other organizations noted in what follows). The following is quite a statement made by the Imam, (pg.32) “If a Muslim cannot find comfort in a world in which others are Christian, Jewish, Hindu, Buddhist, and agnostic (he left out atheist), that person cannot claim to be following the teachings of the Quran and the Prophet Muhammad.” I like what he says, but the evidence is clear, Muslims cannot and will not accept other religions in their midst. The doors of Islam close as soon as possible to other religions openly practicing and preaching their traditions, doctrines and concepts. The question I raise – does he truly believe what he is saying. We know ‘comfort in the world’ for the Islamist is subject to Shariah Law, but is he deceiving us (Sura 3:54 – be the best, as Allah, of deceivers. Sura 3:28 – take not the non-Muslims as friends. Sura 16:106 – tell lies to advance Islam, it is Okay. Sura 9:5 – lie in wait, be patient, ambush them, ‘slay the idolaters.’ Sura 9:29 – Fight those who believe not in Allah. Protect them if they pay the jizyah tax in a state of subjection, and if they refuse to pay the tax, well protect them no more). Imam Rauf’s demand for, and platform suggesting America be Sharia compliant, is his true color of Islamisation shining through the fabric of a blended society and culture of many religions. His quilt will eventually only contain Islam. The practices and preachings within the Cordoba House will reflect the Saudi’s (Wahhabism) and the hate speech so many mosques and madrassas already spout to their attendees. How can non-Muslims, that Understand Islam, not be skeptical of what any Imam or leader of an Islamic support group has to say? The Quran tells non-Muslims (infidels) to be on guard. And why, because the Quran tells Muslims to be deceitful and that Allah is the best of all deceivers. Why does America appear to be letting their guard down? For the Muslim, the Islamist, their country does not lie within the measured boundaries of a nation or country as shown on a map. It lies within the covers of the Quran. The boundaries are those of earth, the world, and a caliphate ruled by Shariah or Islamic Law. Loyalty, by the terrorists, by Muslim leaders, by Imam Feisal Abdul Rauf, is to Islam and not any specific country or organization. If Imam Rauf can do a better job of telling the world, explaining to the world, clarifying to the world, including Muslims, that the Christian God (Trinity), the Jewish God, and the Muslim Allah are the same, then that might change things, but I find his arguments, except for us all being in the lineage of Abraham, weak. And to explain he must do it with the Quran in hand, referencing the Quran as this is the book that dictates what all Muslims must abide by. After Abraham the course Muhammad and Allah takes Muslims, via Ishmael, is different. He even has Abraham building the Ka’ba in Mecca (pg. 53) with the son from his wife’s maidservant. I have no idea if that is true. Imam Feisal Rauf, it has been said, “Together with his wife Daisy Khan (the two) are trying to put a yuppie face on Islamism. But in fact, by associating with The American Society for the Advancement of Muslims (‘ASMA’) they promote jihad through da’wa and the Islamisation of the West by grooming “Muslim Leaders of Tomorrow” (‘MLT’).” At the Saudi backed 2006 MLT conference in Denmark “moderate” Islamists discussions of how to increase Muslim political and social influence was euphemistically termed “bridge building”. This may all be part of the Islamic Strategy of Conquest (blog dtd. 3/22/2010 – Part 23). The American Society for Muslim Advancement (ASMA) is a New-York based nonprofit organization founded in 1997 to elevate the discourse on Islam and foster environments in which Muslims thrive. In Islam, da’wa means a “call” or “invitation,” and has been used to refer to a person being “called” to follow Islam. However, it has developed into the idea of a “mission” or “propaganda,” either in a political or religious sense. The Mission of the Cordoba Initiative aims to achieve a tipping point in Muslim-West relations within the next decade, bringing back the atmosphere of interfaith tolerance and respect that we have longed for since Muslims, Christians and Jews lived together in harmony and prosperity eight hundred years ago in Cordoba, Spain (See note on Ghazali). This mission statement sounds nice, but it is a deceptive approach, a stealth tactic, to bring Islam more actively to America. Countries in the past where pluralism existed, such as Egypt, are now predominately Muslim. Why not have the Cordoba initiative first demonstrate the possibilities by opening the gateway to pluralism in Muslim dominated Countries of today. The Cordoba Initiative and ASMA work together with MLT. Is there a link, it has been asked, to the Muslim Brotherhood, wherein a peaceful approach, as opposed to the use of violence, to convert ‘all for Allah’ is recommended. Their goal – to instill the Qur’an and Sunnah as the “sole reference point for … ordering the life of the Muslim family, individual, community … and state.” This would be done using Shariah Law. Since its inception in 1928 the movement has officially opposed violent means to achieve its goals, with some exceptions. 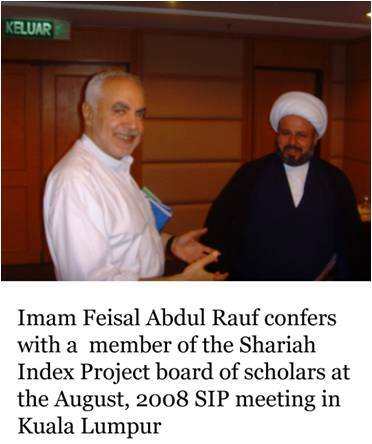 In 2006 August Imam Feisal Abdul Rauf convened in Malaysia The Shariah Project. It was its initial meeting in Kuala Lumpur, where five distinguished scholars of Islamic holy law from four countries were assembled. From the Cordoba initiatives website, “The Shariah (Index) Project seeks to address the religion-politics relationship question that has racked the Muslim World since the death of the Prophet Muhammad. A contentious issue between religious Islamic political and secular political parties within the Muslim World, and between Muslim and Western nations (for whom Church-State separation is a foundational concept), it evolves around the right balance between institutions of political power and authority and institutions of religious power and authority, and whether the modern nation-state Muslims live in should be a secular or religious (i.e. Islamic) state.” It appears to me to seek Shariah law, independent of a nation’s governance or laws, as those laws controlling the people within their religious boundaries, and will attempt to make inroads with the U. S. government, as has been done in many European areas to allow the imposition of Sharia Law. The Mega-Mosque in NYC near the World Trade Center terrorist destruction location is to be called Cordoba House. It will overlook the site of the fall of the Twin Towers. Lower Manhattan Borough President Scott Stringer is behind this structure. He has referred to American’s opposed as ‘haters’ reminding him “of Adolph Hitler.” This is extreme and an example of the boil that is being allowed to generate by enabling this structure to stand in view of the attack by Islamic Terrorists (Muslims) on one of America’s greatest architectural achievements, treasures and symbols. I can appreciate the desire for tolerance and forgiveness, as well as the American nature to be open-minded and accepting, welcoming all to our shores, but not now, not this way, not as a symbol that can so easily be misinterpreted and one that will stand looking at the face of the Statue of Liberty. If Imam Feisal Rauf (and the Lower Manhattan Borough) really wants a pluralistic society maybe then Cordoba House should be pluralistic and properly reflect on the objective. Include in it a Jewish, Christian, and Islamic Center, areas where Torah studies, Bible Studies and Quran Studies can occur simultaneously, where people of all religions can come and go. Include a Synagogue, a Church and a Mosque were services can be conducted at the same time, yet not interfering with the other. Make it a love nest of religions, where all hands of all traditions can join and celebrate a goal of peace for all the world. Let it not be Abrahamic, but for all. Can Imam Feisal Abdul Rauf embrace that concept? Is this idea too Pluralistic for him? The Brits have already weighed-in, and in a most poignant fashion. Call it – “One Insult Too Far” – http://www.jihadwatch.org/2010/06/pat-condell-on-ground-zero-mosque-is-it-possible-to-be-astonished-but-not-surprised.html Pat Condell reflects, even as an Englishman, the feelings of Americans, but it is our Government that seems crippled by political correctness. Listen. We pray that America will come to its senses. We have opened many cities to the building of Mosques, even when Muslims have not allowed churches or synagogues in their countries, but this particular center will cause more trouble than it is worth. Why raise another political dilemma; America already has plenty to contend with. Grace and peace. Defend America and the Freedoms we enjoy. [ii] Ghazali (1058-1111 ad) – open-minded towards other faiths. Studied and influence Sufi thinking (the mystics – their Wisdom). He was willing an actively promoted advancing Islam forward into a modern world, more tolerant and accepting. He would encourage Muslims today to rise and accept the challenges of the West.